There is no glory in removing fasteners from the bottom of my 1953 Shepherd Sportsman. It is all about being finished. This clip responds to your several requests for a walk-through on how I am removing them, one by one by one. 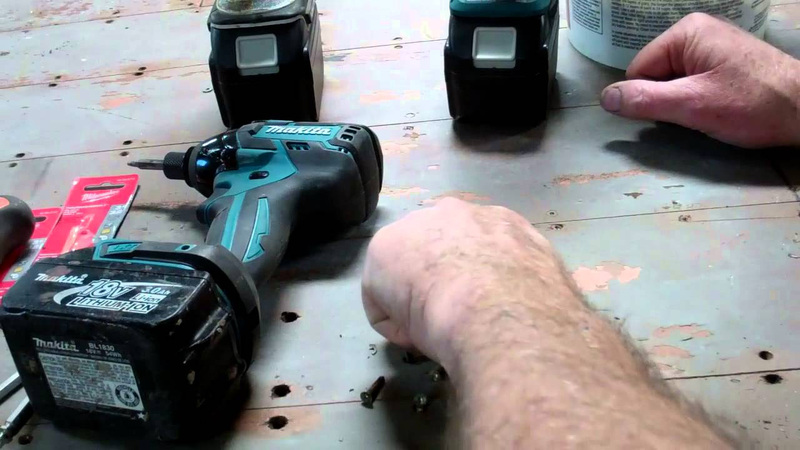 – The shop is well-stocked with cordless drill and impact guns. Today I will use four of them, with a different driver in each gun. Doing so saves me from endlessly removing and inserting drivers, which makes the drudgery pass by more quickly. – The two impact guns hold the square drivers – a #2 and a #1 – I use to remove the #8 x 1-1/2” screws driven into the ribs and the #6 x ¾” screws driven into internal battens running between the ribs. – One screw gun holds a 3/32” twist drill, and the other one holds #2 Pro Grabit screw extractor. Heavy Bodied stripper to the planks. What a great suggestion. I had about 60 percent of the fasteners removed in the scant two hours I had been working when I shot this clip. Reaching the same point on the starboard side took me a bit over three and a half hours. The process is pretty straightforward. Drill through the center of the filler and into the square drive hole. Clear the debris with an air chuck set to run at 120 PSI. Then “simply” insert the requisite square driver and out comes the fastener. In my experience, about 80 percent of the fasteners did simply back out, but the other 20 percent offered all sorts of impediments. Some of them broke, so only part of them released. Others simply spun in place and thus released with the plank when it was pried off the hull. But about 10 percent of them required reaching for the Pro Grabit. But as I draft this description on December 1, the entire port side is free of fasteners, and the circa 1850 is now working on the forward third of the port side planks.